The tips were organized in six categories. #1 Step 1 Start with your desired outcomes (goal), your audience and your messages, then build your campaign via Association Management Center (AMC). #2 Use the 1-7-30-4-2-1 editorial calendar from Joe Pulizzi of Content Marketing Institute via SCD Group. #3 Consistent brand messaging from the National Pasta Association via the Kellen Company. #5 Building integrated marketing plans is a must to effectively mix new and traditional. New additions to plans are content marketing strategies and incorporating social throughout your entire organization – see Spredfast white paper on that topic ... via the Bostrom Corporation. #6 Don’t be afraid to ask your members to get involved with the launch of your organization’s Twitter Strategy—just make sure they have the tools to get the job done! From AAHPM (American Academy of Hospice and Palliative Medicine) via AMC. #7 Increase results by combining live and digital events from U.S. Farmers & Ranchers Alliance via AMR Management Services. #8 Build Twitter relationships by retweeting tweets from NYC Women in Communications Inc via Kellen Company. #10 Getting started on Twitter can be tough – use Twitter Search and Twazzup to find people who are already talking about your profession or industry who have a lot of followers and link to them, mention them etc. to get your Twitter feed going. via the Tile Roofing Institute via Bostrom. #11 Personalize your invitation with a QR code sending members to a personal invitation from the president from APHON via AMC. 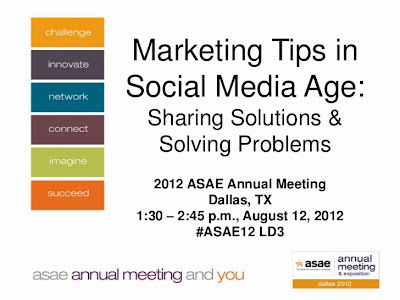 #12 Create mobile apps or mobile sites specific for your conference from NASCIO via AMR. #13 Use your data: When the Airline Passenger Experience Association developed a new mobile application, it was able to test its success by using Google Analytics via Kellen. #15 Combine mobile apps with your website development from PiMA/Tile Roofing Association via Bostrom. #16 Use Facebook to engage your members for feedback from AANN (American Association of Neuroscience Nurses) via AMC. 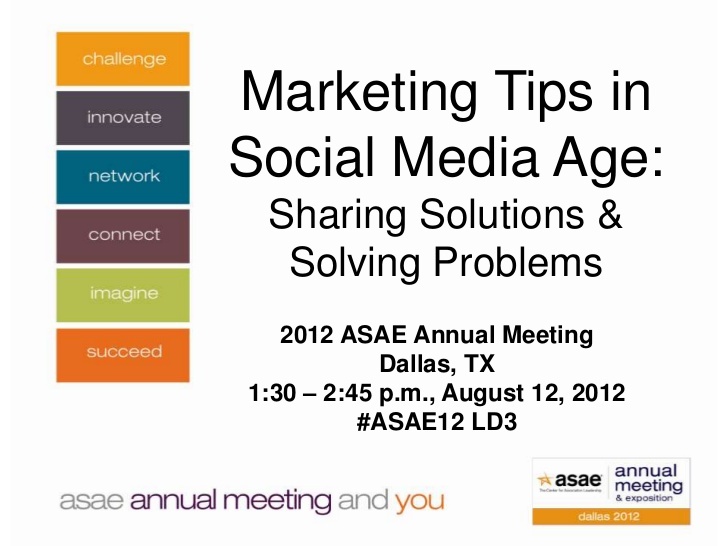 #17 Develop a LinkedIn marketing strategy for your association from American Academy on Communications in Healthcare via AMR. #18 Enlist member companies to expand reach of your SM campaigns from NPA via Kellen. #19 Don’t allow the association to force you to be social network police from the Sherwood Group. #20 Build specific Facebook accounts for individual programs such as certification from the Tile Roofing Institute via Bostrom. #21 A slide show on your website is a great way to showcase members from NFBA (National Frame Building Association) via AMC. #22 Train your members to blog to create “an army” of bloggers with a consistent local and national message via the National Christmas Tree Association and AMR. #23 Use content to drive membership: New York Women in Communications (NYWICI) combines web branding, blogging, twitter, facebook and YouTube into a cohesive marketing campaign via Kellen. #25 Google Analytics’ new features include mobile and social tracking tools, advertising tracking enhancements, and so much more from Bostrom. #26 AAHPM added value to an already valuable course. They created a new offering in conjunction with their regularly sold out Board Review Course—Premium Seating via AMC. #27 After determining desired outcomes, target audiences and core messages, use the Periodic Table of Content Elements to determine delivery tools from Andy Crestodina of Orbit Media via AMR. #28 Window Covering Safety technicalities can get dry, so Kellen developed The SuperBaby Safety Campaign on behalf of the Window Covering Safety Council. It is a series of online videos in which your host, Super Baby, explains how children can be kept safe with window coverings. #30 Use off the shelf tools to track ROI or the effectiveness of Social Media tools like Twitter – tools are www.twazzup.com, socialmention.com, and addictomatic.com via Bostrom. Google has by far one of the most reliable services when it comes to knowing places and best restaurants or even hotels around anywhere in the world. These services are of course built and can be found on their search engine although some still prefer social networking sites.